General Information This is the first issue of the UCC Newsletter, to be published on a regular basis by the University Computer Center to interest the UCC. It is intended to help the user keep abreast of recent information associated with thier use of UCC announcemnets and notices of events, and schedules will be contained in this newsletter when appropriate. UCC is attmepting to serve as a clearing house for departments looking for qualified programmers and persons who can fill these positions. Departments or programmers interested in using this service should contact Phil Dylhoff, 407 PRC, 353-3832 or leave a message at the UCC main office. Library Services, The UCC Library, located in the temporary building, east of the main enterance to the Computer Center, is both a reference material and a program documentation library. It is open from 8-12 a.m. and 1-5 p.m., on Monday through Friday. THis materials and services available from the library are described below. 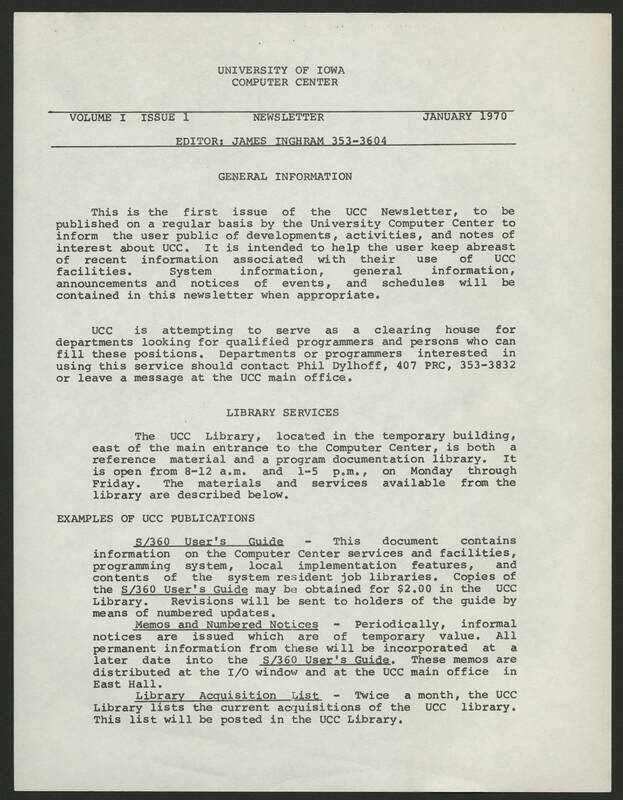 EXAMPLES OF UCC PUBLICATIONS "S/360 User's Guide" - This document contains information on the Computer Center services and facilities, programming system, local implementation features, and contents of the system resident job libraries. Copies of the "S/360 User's Guide" may be obtained for $2.00 in the UCC Library. Revisions will be sent to holders of the guide by means of numbered updates. "Memos and Numbered Notices" - Periodically, informal notices are issued which are of temporary value. All permanent information from these will be incorporated at a later date into the "S/360 User's Guide." These memos are distributed at the I/O window and at the UCC main office in East Hall. "Library Acquisition List" - Twice a month, the UCC Library lists the current acquisitions of the UCC library. The list will be posted in the UCC Library.